We recently wrapped up our 10th session of Financial Peace University. We have offered it 2-3 times a year for the last several years at our local church in Galveston County. I wanted to take a moment and share the results that we turned in to Ramsey Solutions of how this class did. If you’ve ever seen a promo of FPU like this one, you’ll hear claims of an “$8000 turnaround” in 90 days. They calculate this by taking how much debt students pay off + how much money they save over a 90 day period. Several years ago FPU was 13 weeks long, it is now 9 weeks long so there is some extrapolation there. And, it’s an average across the nation. Five million people (that’s 5,000,000) have taken this class over the last 25 or so years so they have a LOT of data to draw on. Near the end of every class the students anonymously turn in their Financial Results detailing how much they saved, how much debt they paid off, and how many credit cards they cut up and closed. You ever see those Slim-Fast commercials? 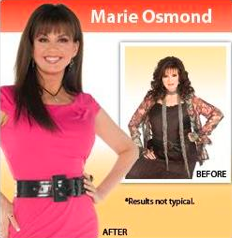 You know, “I’m Marie Osmond and I lost blah blah pounds on Slim-Fast!” ….look closely. There is a disclaimer on screen, in reaaaaaaaally small print, that says “Results Not Typical”. You’ll see it every single time. Well I’ve told you all that to tell you this. The results from the classes we’ve held “typically” fall right in line with this $8000 turnaround number. Our most recent class statistics are posted above and if you extrapolate to 90 days, the turnaround per family from the seven families in our class is a blowout $8600. 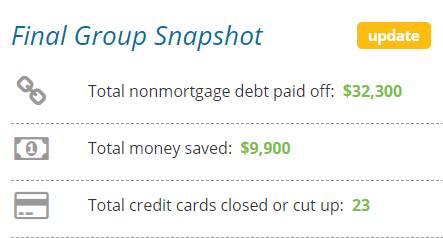 I’m personally not crazy about extrapolating like that, but even at the raw baseline 9-week mark (63 days) the average is $6,028 in debt paid off and money saved per family in the class. That’s huge! We are so proud of this group. Dave Ramsey teaches the class, we facilitate the class, but these folks did the hard work. They showed up week after week, they did their homework, and most importantly they put into practice what is taught in class every single week. They are financial rock stars with bright futures. If you’d like to find an FPU class in your area, check Dave Ramsey’s website. And if you are in the South Houston / Galveston County area, our class schedule is posted here. Pssst….Hey Kid….Wanna Buy A New Car?